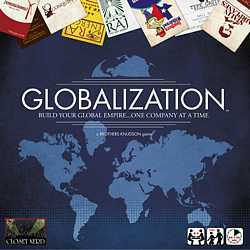 Globalization brings the exciting world of big business into your living room. You are the head of a multinational corporation with one goal in mind: to make money. Outbid your competitors to acquire businesses within six different industries and grow your conglomerate. Streamline operating costs, build additional factories, sue your competitors or take one of your subsidiaries public for big returns. Your corporate strategy will impact which companies you buy and how to take your corporation worldwide. The synergy that comes from the right company combinations increases your perceived net worth. The first to reach a billion in net worth wins!